Light travelers? You can now book tickets at lower prices on selected Etihad Airways routes. This promo is applicable for booking from October 18 to December 18, 2017, and your travel period will be until March 31, 2018. This is a new hand baggage only 'deal fare' on two key routes for the winter season, allowing travelers to purchase lower fares in economy class if no checked baggage is required. 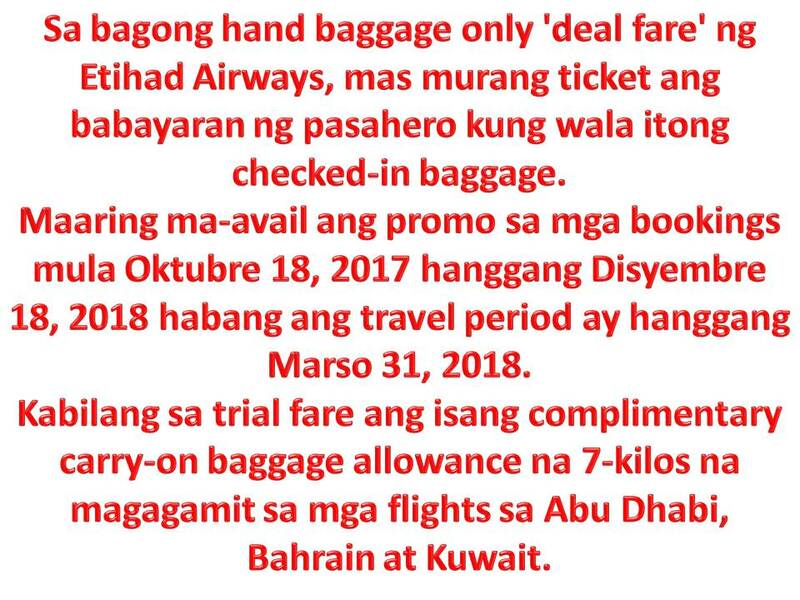 The trial fare includes a complimentary carry-on baggage allowance of seven kilos and is available on flights between Abu Dhabi, Bahrain and Kuwait for travel until March 31, 2018. According to Etihad Airways Executive Vice President for Commercial Operation, Mohammed Al Bulooki, many passengers of Etihad travel for business, weekend getaways or day trips that don't require checked baggage. He said this is a reason why they are doing some test on new lower fare on these key routes. He added this is just first of many trials the airline is planning to implement this coming month. 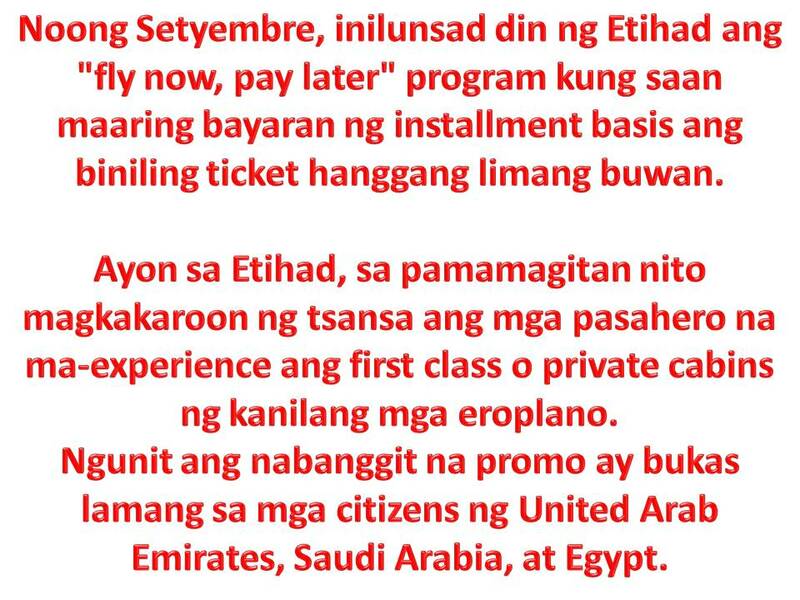 Last September, Etihad launched a travel plan that allows the passenger to fly now and pay later where you can spread out your payments up to five years. According to Justin Warby, Etihad Airways vice president for digital strategy and innovation, spreading the payment over a period of months is also a great way to indulge in premium cabins. People who have never flown first class or in private cabins can get the chance to experience a high-end flying experience, and pay for it in installments. To book now, all you have to do is go through the online purchasing process and when you get to check out, select "Pay By Installment". You can then pick the payment period you're most comfortable with, anywhere from three to sixty months. 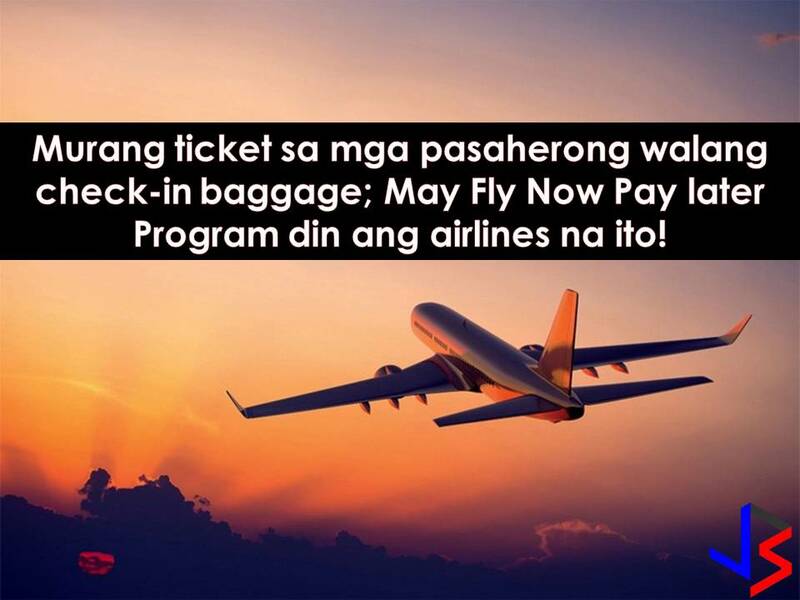 Now, you just hop on your flight so you can have fun now and start paying it off later. But sad to say, this promo is not applicable to all citizen, but only for residents of UAE, Saudi Arabia, and Egypt.